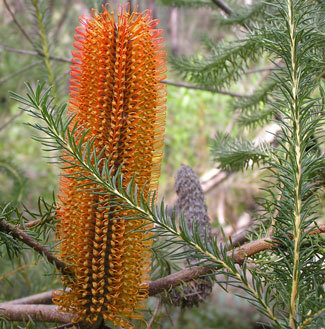 The Heath Banksia, or Heath-leaved Banksia, is one of the most easily recognised Banksias along the coast and adjacent ranges of New South Wales. 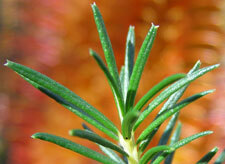 Its rosemary like foliage readily identifies it. It flowers in autumn and winter, when its orange to red flower spikes provide a rich supply of nectar for birds. 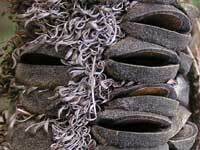 The flower spikes are around 20cm in length, although they can be up to 30cm. The first image below shows the ericifolia's cone after flowering. 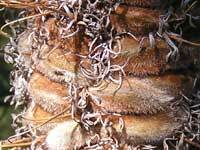 The light brown oval shaped capsules (which are know as follicles) contain two winged seeds. The follicles are stimulated by fire, including smoke, to release the seeds. The second image shows opened follicles. 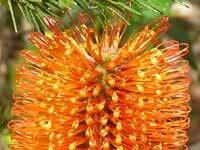 Unlike Old Man Banksia, the Heath Banksia is destroyed by fire. That is, it can not regrow from lignotubers underground - only from seeds. 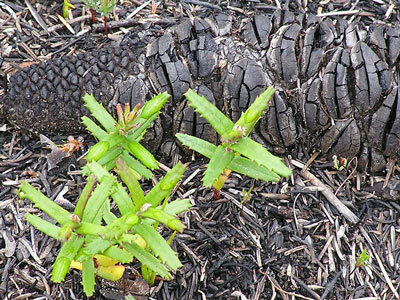 This poignant image shows a Heath Banksia's cone and several seedlings. The seedling's leaves are very distinctive and quite different from the parent's. They're also lighter in colour.